It's been hot here. 104 yesterday and maybe a few degrees less today. To make matters worse there are fires in several areas around Southern Califorina, one less than 25 miles away. Needless to say the air quality stinks and no one wants to go outside. It was a good day to stay inside and sit in front of my tiny window air conditioner and sew. This is my TNT jeans pattern sewn in dark navy stretch denim. I hemmed them a bit too long since denim usually shrinks after sewing, even though I wash and dry the fabric on hot four times before cutting the pattern out. I decided to sew the corduroy pants after I finish these. I thought it would just take too long to get finished if I made them at the same time. If you haven't noticed I like to get garments finished quickly. In fact, I like to sit down and sew until I can try the project on. After that, depending on how it fits, I may continue until it's done, or I may take a break if I have to tweak the fit. These jeans fit every step of the way. That's the great thing about TNT patterns. This pattern is an evolution of this capris pattern from the Burda Plus WOF Spring 2004 pattern magazine. I've since lengthened them and changed the pocket and leg shape. These jeans are very comfortable and because it's a traced pattern, I can always go back to the original and start over if I ever finally decide to lose weight. After seeing the photos, I've become very motivated to do something. Tomorrow I'll start on the corduroy pants. I need some opinions. Do you think I should discontinue to topstitch the yoke. I think it gives me a horizontal line right where I don't need it, but it's traditional on jeans. What do you think? Sorry the photo doesn't show more details. In consideration of my readers, I thought a small picture was appropriate because some things just need to be covered. In fact, maybe the topstitching doesn't even matter since I always wear my tops untucked. It's tucked in the photos to show details and fit of the jeans. Nice looking jeans. Got to love TNT patterns. As for topstitching the yoke, my answer is a resounding yes. IMHO such details help break up the expanse so to speak, giving the illusion that the area is smaller. TNT's are the best! Especially pants. 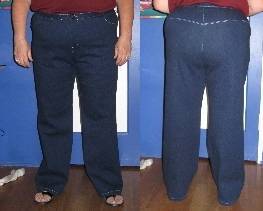 Isn't it great to be able to sew a pair of jeans and not have to agonize and spend hour upon hour shopping for them? I have this issue and I'll have to take a closer look at this pattern. I like the detail that you have added to the yoke--is that topstitching? It almost looks like piping. I like the effect. Your pants look great. Great fit!!! Sherril, your jeans look so sleek! I actually like the topstitching, which I find makes your jeans look so distinctive. 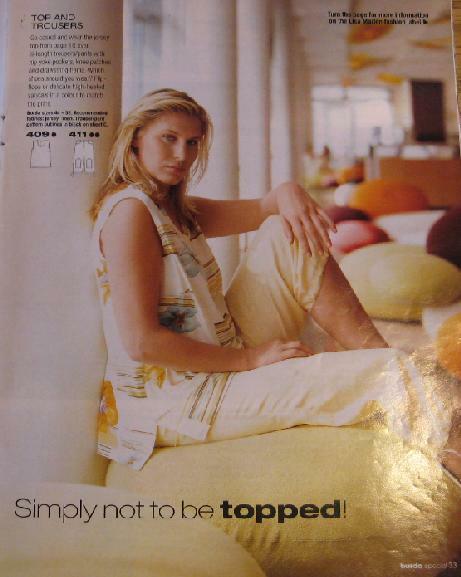 Remember Ditto jeans back in the day? We could poke fun at them now, but come to think of they really were flattering. However, your jeans have that modern flair and nice silhouette. Its funny I was looking at the issue just the other day...didn't realize that your TNT jeans pattern was from these capris?! As for the topstitching, go for the final finishing details especially if you are the only one who will see them! Those details will make you proud every time you put the pants on! Great fit on the jeans!